So……….. anyone got ~$1200 to send my way? Why, you ask? TENORI-ON, the new seemingly brilliant and addictively fun musical composition device from Yamaha. TENORI-ON means “sound on your palm” in Japanese. That’s a pretty fitting description of how it works. 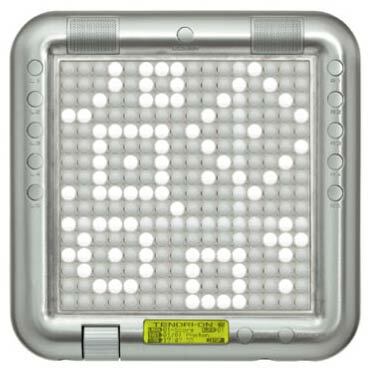 While pressing LED buttons on the 16 x 16 grid as the loop indicator scrolls, players can create tones and rhythms, with each layer of music having its own tempo. There are a total of sixteen layers of music and they can be thought of as traditional recording tracks. Any of TENORI-ON’s six modes can be assigned to a layer and all layers can operate concurrently. Those layers are grouped into blocks (which I think is one loop across the device’s face), and blocks can be copied, sequenced and edited for variations on a theme and extended pieces. Combining all those functions, one can create some really complex music. TENORI-ON can read samples and manipulate outside sounds via SD card, giving it nearly limitless compositional capabilities. It is also MIDI-capable, for interfacing with a second TENORI-ON or outside machine, such as a computer. Press a button to play a sound once. Press-and-hold to play that sound on every loop. Turns the instrument into Pong. Press buttons to have a ball ping between those buttons. Make music by drawing lines and curves. Reminds me of playing a harp. Press a button and a ball bounces up from the bottom to the button that was pressed. Lower buttons have more rapid beats. Higher buttons are slower in tempo. I sense some seriously interesting polyrhythmic possibilities here. Also creates sustained notes, but only when you’re actively pressing the buttons. As part of the device’s launch, Yamaha commissioned three noted electronic musicians to create songs using only on the TENORI-ON–Jim O’Rourke, Atom Heart and Robert Lippock of To Rococo Rot–and is giving them away as downloadable MP3s. O’Rourke turns in an ambient soundscape while Atom Heart seems to noodle with a malfunctioning sonar on a piece that would be a home on the Forbidden Planet soundtrack. Lippock, true to form, crafts a pretty nice piece of IDM. You can listen for yourself at Yamaha’s TENORI-ON site. Needless to say, I want one. Unfortunately, TENORI-ON is currently only being sold in the UK as a test market–at £599–and apparently, the entire nation is out of stock at the moment. But hey, if you just have to have one now, I spotted a couple on eBay. Otherwise, there’s always the hope that more become available in time for the holiday shopping season.